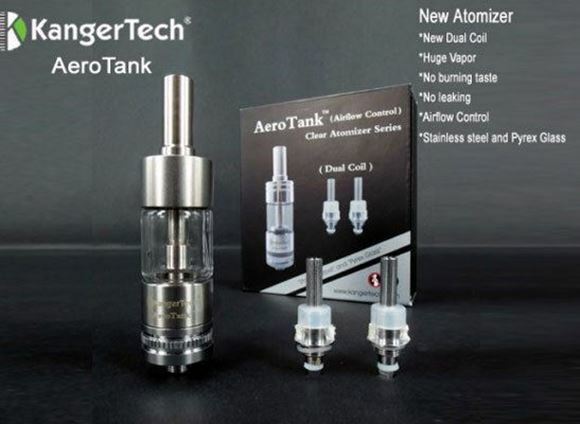 Note: The Kanger AERO Tank BDC Pyrex Glass & Steel set comes with 1ohm coils and may not operate on some sub ohm units. The Kanger AERO Tank differs from the Nautilus on how to adjust airflow. On the AERO the knurled ring screws up or down. When fully screwed up it nearly closes off all airflow, when fully screwed down it reveals the air flow holes completely around about the tank so this would be the completely open position. Therefore you want to cover them up partially to certain extents to regulate to your liking! You can use the same replacement tanks for the Kanger AERO Tank as are used for the Kanger ProTank 2 & 3. The atomizer heads are dual coil are compatible with the dual coil heads on the Kanger Protank 3.